The restaurant boasts a delicious fusion of Chinese and Japanese flavors with a Pan-Asian flair, alongside a variety of appetizers, soups, salads, stir-fry and traditional Asian noodle dishes. 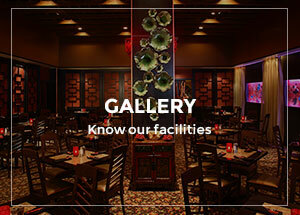 Select locations include hibachi tables for an entertaining and delicious evening! Lillie's also offers a sushi and sashimi menu that includes the freshest cuts of Ahi, Sake and Unagi, in addition to a medley of cut rolls. Exotic desserts and premium beverages, including a vast array of Sake, are sure to entice. Come experience Lillie's for yourself at one of our four Golden Nugget Casino locations.